The incredible mastery of pianist Marc-André Hamelin has given rise to abundant superlatives in the press. 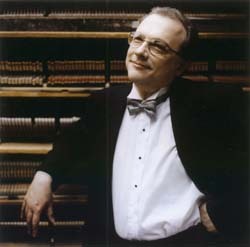 New York Times critic Harold Schonberg reverently described him as a “super virtuoso” after his New York debut, and by 1988 the same daily didn’t hesitate to compare him to such piano giants as Pollini and Brendel. New Yorker writer Alex Ross considers him legendary, stating categorically that there’s no one like him at this time. 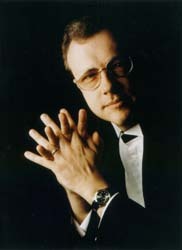 In 1999 he was chosen by the British magazine Classic CD as one of the hundred best pianists in history. Music magazines that specialize in reviewing recordings, such as Gramophone, Diapason, Répertoire, Fanfare, American Record Guide--and La Scena Musicale--have nearly always given him top marks for the twenty CDs issued on the Hyperion label. Even the toughest critics run out of superlatives and bow to his talent. The real Marc-André Hamelin is in fact very different from the emotionless superman image that the press would like to bestow upon him. Anyone who gets to know him well enough will discover a warmhearted, exceptionally intelligent man, yet one whose simplicity and humility are surprisingly unlike the excessive behaviour usually associated with stars. Rather than the rush of a celebrity’s existence, Hamelin much prefers the simple pleasures of daily life: a good meal with a fine wine, long walks, good books, going out to a film, and intense conversations with friends. He has a delightful, occasionally quirky sense of humour that he likes to share with those around him. He adores Quebec comic and musician François Pérusse and a number of brilliant American comedians. His hearty, outgoing laughter breaks the ice with the most reserved people. It seems as though he likes nothing better than getting others to burst out laughing at his terrible puns and spoonerisms. Since the beginning of his career, his concert encores have revealed this little-known side of his personality. 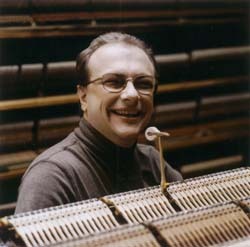 His soon-to-be-released CD, Kaléidoscope, is devoted to this sense of humour. Serious Fun, a CD planned for spring 2002 release, will feature an engaging collection of humorous songs recorded live with his better half, soprano Jody Applebaum. The piano repertoire has never been so well served as by an artist like Hamelin, who gives the music every fibre of his being. Win a collection of 17 Marc-André Hamelin single CDs on Hyperion. Visit our web site www.scena.org for details. Courtesy of Hyperion and SRI Canada. Marc-André Hamelin’s Pro Musica recital in Montreal on December 5 will include Beethoven’s first (Opus 2, No. 1) and last (Opus 111) sonatas, and Schumann’s Sonata No. 2. “This isn’t a marketing ploy,” he emphasizes. “They’re simply works that I like, that’s all. You’ll never see me recording all Beethoven’s sonatas. The market has been saturated for the past few years and I don’t want to saturate it further. I can’t listen to the Appassionata and Waldstein any more. They’ve been played to death! If Opus 109 and 110 weren’t so marvellous, I’d say the same thing.” Also on the program is Stephan Wolpe’s Passacaglia, which Hamelin remembers playing at his graduation recital at Philadelphia’s Temple University in 1983. Audiences can probably bet on some memorable encores.